TX: Brewster Co., Big Bend NP, Chisos Basin, 21 August 1995, Charles W. Bordelon, Jr.
from early April to late June, and from late August to early October." Similar Species: Four species of Syntomeida reach the U.S.
Blanchard A. 1973. Record and illustration of some interesting moths flying in Texas (Sphingidae, Ctenuchidae, Noctuidae, Notodontidae, Geometridae, Pyralidae, Cossidae). Journal of the Lepidopterists' Society, 27(2): 103-9. Conner, W.E , R. Boada, F.C. Schroeder., A. Gonzàlez, J. Meinwald, & T. Eisner. 2001. 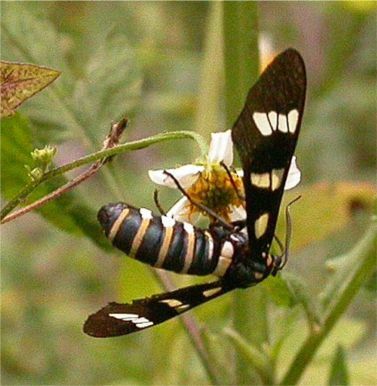 Chemical defense: bestowal of a nuptial alkaloidal garment by a male moth upon its mate. Proceedings of the National Academy of Sciences 97(26): 14406-14411. Druce, H. 1884. Biologia Centrali-Americana. Insecta. Lepidoptera-Heterocera. Volume I . R.H. Porter, London. Pl. 70, fig 25. Janzen, D.H. & W. Hallwachs. 2005. Dynamic database for an inventory of the macrocaterpillar fauna, and its food plants and parasitoids, of Area de Conservacion Guanacaste (ACG), northwestern Costa Rica <http://janzen.sas.upenn.edu>. Knudson, E. & C. Bordelon. 2003. Illustrated Checklist of Big Bend National Park. Publication 3. Texas Lepidoptera Survey, Houston. (treats 1300 species, 12 color plates). Sanderford, M.V. 1992. 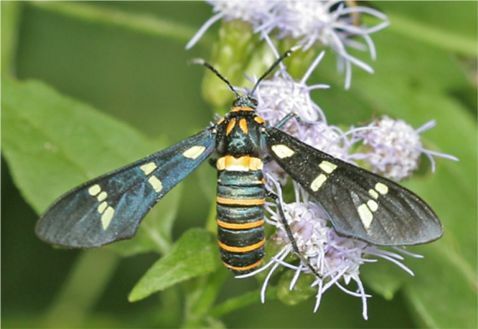 Acoustic communication of the polka-dot wasp moth, Syntomeida epilais Walker (Lepidoptera, Arctiidae, Ctenuchinae). Ph.D. dissertation, Wake-Forest University, Winston-Salem, NC. Yack, J, T.A. Timbers, W.E. Conner, A. Aniello, & F. Schroeder 2004. Defensive Flocculent Emissions in a Tiger Moth Homoeocera stictosoma (Arctiidae, Arctiinae). Journal of the Lepidopterists’ Society 58(3): 173-177.